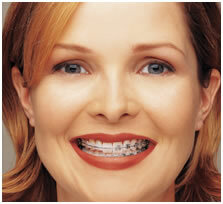 Tooth coloured braces work in the same way as traditional metal fixed braces. However, they are much more aesthetically pleasing as the brackets are made of a translucent ceramic material which allows the natural colour of your teeth to show through. Ceramic Braces may be used whenever metal braces are appropriate for treatment braces are strong like metal, they come off easily at the end of treatment. You can wear braces even if you participate in sports. 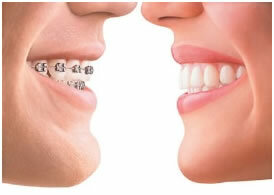 Clarity aesthetic braces are the clear alternative to metal braces. An attractive translucent appearance and comfortable design gives you all the self-confidence you need to face each day with a smile. You’ll be noticed but your braces won’t! You’ll feel better about yourself knowing that the natural beauty of your teeth is shinin g through, and not your braces braces won’t stain or discolour. They’ll look as good the day they come off as the day they did when your orthodontist put them on. Very rarely can a case not be treated however if you need conventional brace treatment we only use modern teeth coloured ceramic brackets. This is only necessary for extreme cases or where the bite may need significant changes. 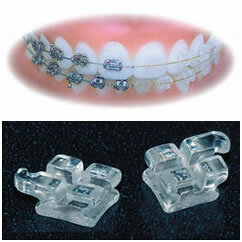 we offer fixed braces in the form of tooth colored, ceramic braces. Ceramic braces are less noticeable than metal braces. The brackets are fitted and a metal wire is still used to straighten the teeth but it can only be seen on close inspection. The ceramic brackets are an extremely aesthetic way to straighten teeth. 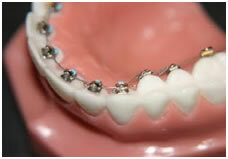 Fixed braces use a flexible wire clipped into the brackets to straighten crooked teeth. As the treatment progresses the flexible wires are changed to stiffer, more rigid wires to straighten the teeth and close any spaces. 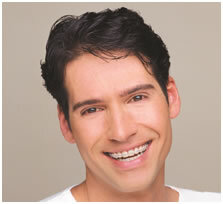 Fixed braces are permanently fixed to the teeth and removed at the end of the treatment. Treatment times can vary between 9 months and 2 years. Regular visits to your dentist are therefore needed to make adjustments as your teeth start to move. The end result is straight, less crooked teeth and a beautiful smile . We use innovative orthodontic brackets - our tooth coloured brackets are smooth and crystal clear, giving you a virtually invisible and comfortable feel and experience. There are many of us, especially older teenagers and adults who are concerned with the way our teeth looked. And yet, we cannot really do much about those unsightly crooked teeth because we do not want to be seen wearing orthodontic braces at an old age. This can be said as one of the biggest factor hindering adults from seeking orthodontic treatment , simply because orthodontic braces can be more unpleasant looking than their existing crooked teeth . This has all come to a change with the development of invisible braces , also known as clear dental braces which are not only highly aesthetic, but also straightens teeth at the same time, increasing the demand for adult dental braces . In the older days, aesthetic braces are done by fitting orthodontic metal braces on the inside surface of the teeth, facing the palate and the tongue. This is known as lingual braces . This method although is aesthetic, is not as effective compared with orthodontic braces placed on the front surface of teeth and can also be very traumatic to the tongue. using clear plastic aligners to straighten teeth and this stems the origin of the popular invisible braces system, Invisalign™ . Invisalign™ are not really braces per se, rather they straighten crooked teeth via a series of removable plastic invisible aligners . This means that tooth movement is done in sequence where once the maximum amount of movement allowed by an aligner is achieved; the next planned movement is carried out with the next invisible aligner . Each individual case needs to be assessed and evaluated carefully by a specially trained dentist or orthodontist. Thus it may be useful to do some research before attending a consult as not all dental providers offer such service . At the consult appointment, basic examination will be carried out and baseline records such as ‘before’ face and profile pictures and x-rays will be taken. An impression or mould of your teeth will be taken and that acts as a foundation for the fabrication of your invisible braces. visual images depicting the initial position of your teeth to the final stages of expected teeth position. This allows you to visualize the treatment even before you start, another great advantage of invisible braces compared with other orthodontic braces . Sequential plastic aligners are fabricated from thermoplastic material via computer analysis so that it fits your teeth perfectly, allowing precise and detailed movement to straighten teeth . Sometimes, additional accessories such as orthodontic elastics and composite resin blocks maybe added in conjunction with invisible braces to aid treatment. How do I know if invisible braces are suitable for me? Due to the limitations of invisible braces , it can only be used to treat mild to moderate types of malocclusion or crooked teeth. Hence it is essential to discuss your concerns and goals with your orthodontist. This allows them to assess your case according to your needs and pick the best treatment choice, be it invisible braces or orthodontic braces , whichever that is more suitable. They will be able to tell you the best treatment option and explained the expectable treatment outcomes. This should be done before commencing any sort of dental treatment to avoid disappointments and unnecessary dispute. Treatment consists of a series of aligners that you will switch out about every two weeks. Each aligner is uniquely calculated to your teeth and will gradually shift them into the correct place. Invisalign is completely custom-made for your teeth, so the end results will be a smile that you truly love. 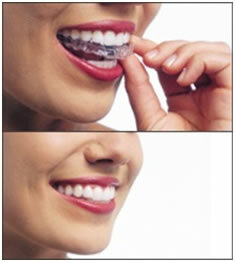 Invisalign is an effortless solution to braces. It is clear, customized, comfortable and most of all removable. It allows you to work on your smile without interfering your day-to-day activities. This treatment is used for an array of orthodontic issues including crowding, spacing, overbite, under bite, open bite and deep bite. 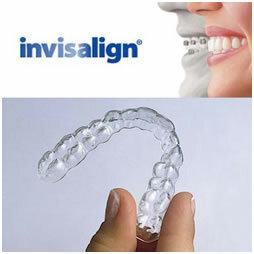 Invisalign has 1 million patients worldwide. 9 out of 10 patients recommend Invisalign to their friends and family. This is because people prefer the clear solution to the traditional brackets and wires. The initial consultation for Invisalign with your local orthodontist is usually free of charge. During this visit, the orthodontist will discuss issues and desired results regarding your teeth. Then, impressions of your teeth will my digitally taken so that your orthodontist can plan your entire teeth movement. Next, customized aligners will be made; A full treatment usually has 20-30 aligners per arch. Finally, wear your aligners at all times with the exception of eating and drinking. You will have occasional visits with your orthodontists to monitor your process.